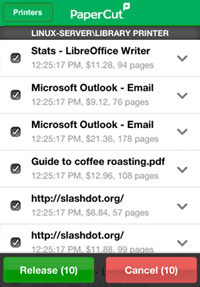 What can Mobile Print Release do? Mobile Print Release is a powerful print workflow application that enables you to offer your users secure print release on any printer within your print environment. Providing document security and control to users is a must for any active print management solution. With Mobile Print Release, there is no fixed hardware requirement allowing you to cut down on costs. When document security is important a user can select a secure printer queue and then release the job from their mobile phone once at the device. Sometimes referred to as "Pull Printing" or "Push Printing" printing; Mobile Print Release allows you to offer a new level of security on your printers. With no dedicated hardware, Mobile Print Release is ideal for organizations interested in keeping costs low. Mobile Print Release is available straight out of the box. There is no need for users to install 3rd party applications or access an off-site App store (such as Apple's iTunes store). System Administrators can rest assured knowing that all network traffic and application deployment is managed securely in their own network. 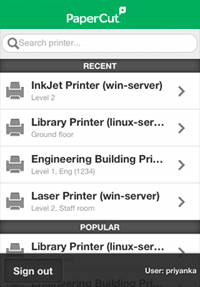 Users can find their desired printer quickly and easily using the built-in search. The search terms are matched against the printer's name, location and alternate ID. The alternate ID is a short code that can be set by the system administrator that allows for users to quickly find the required printer with their smartphone/tablet. Administrators can easily create QR codes for hold/release devices providing a convenient way for users to automatically select the device. While users can search to locate a device, QR codes provide a mechanism to launch Mobile Print Release directly with the printer automatically selected. Users simply scan the QR code on the printer with their mobile, which will automatically open the mobile release queue for the scanned printer.